both a blender and a juicer? If so, you have the kind of appreciation for specialized tools that will make you like Rogue Amoeba‘s interesting and attractive new Fission utility. 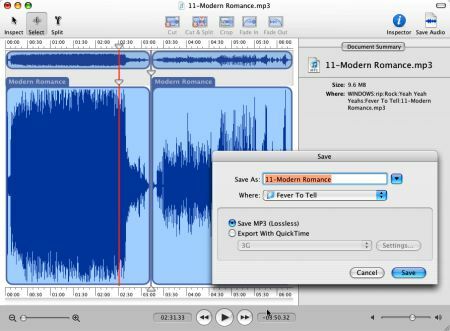 Fission does one set of audio management tasks very, very well: cutting and splitting audio files–including MP3 and AAC files–and then saving the fragments as individual files. One of the big deals about the tool is that when it saves your file fragments, it does so in a lossless save operation, even on such a notoriously “lossy compression” scheme as MP3. It will also easily do fades — to fade audio in or out, blend two clips together in a crossfade, and easily crop sections of an audio file, for example to remove a long silence from a file. It supports AIFF and Apple Lossless files as well as MP3 and AAC, handles stereo or mono files, and supports Intel Macs in a Universal Binary. 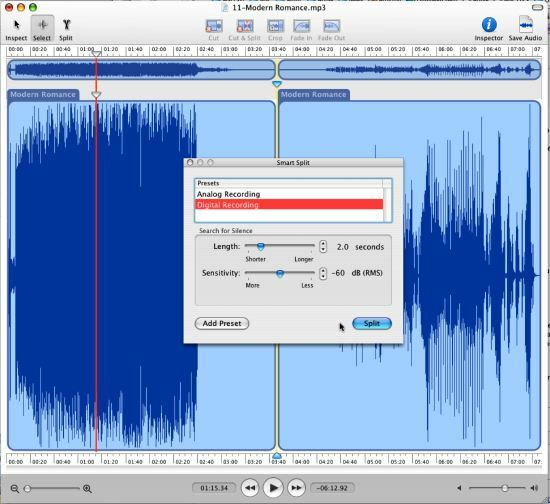 Editing podcasts and audio files captured by Rogue Amoeba’s excellent Audio Hijack Pro utility, which captures audio from Skype calls, iChat sessions, etc. Creating MP3 ringtones excerpted from larger audio files. These needs are indeed fairly specific, and I suppose you either see the value of a USD$32 single-purpose tool or you don’t. (Fission is also available bundled with Audio Hijack Pro for USD$50). But if you do have the genuine need for Fission, you’re going to love the elegant simplicity of the application, and the thoroughgoing Mac-ness of its user interface. Here’s a simple example: Track 11 of the Yeah Yeah Yeah’s Fever To Tell is called Modern Romance, and my CD rip includes the “hidden bonus track” separated by several annoying minutes of silence. I like the bonus track…Karen O chicks out the drum beat with her mouth, the band returns for a little coda, and a slight but enjoyable little pop tune emerges from the mini-wreckage. I like this track, but hate having to grab my iPod and flip past 3 minutes of silence. Fission to the rescue. Fission has a “smart selection” feature that took a pretty good guess at what I wanted by analyzing the silence between the two songs in the file. By default, it split the difference on the silence between the two tracks, and divided the track down the middle. The next step, then, was to mouse over the silences fore and aft of the new tracks, and select the “cut” command to remove the dead air. A cool, intuitive and easy feature allows you to “scrub” the audio while you’re working in the editor: this means you drag over a selection and hear the audio contained. Use that, along with the easy zoom feature, and you can get as microscopic as you need to be for your audio surgery with a few simple drags and clicks. Once the file is fully, well, fissured — split into as many pieces as you wish — the Save button figures out what you want. It prompts for a file location and naming convention, and then saves each file fragment, miraculously lossless, into that directory location. I have, I figure, at least 5 other tools that can do these exact same transformations on audio files, but none of them with the kind of hyper-focused elegance and simplicity of Fission. If you spend any substantial amount of time wrangling with audio and music files, Fission is worth fitting onto your tool belt. Glorious Day! I’ve been looking for this exact tool for months. I have a few live recordings I need to cut up before I can even fit them into Garage Band. It would also be useful to cut up live recordings between songs, so when you burn an audio CD it’s not one long file. Of course the Vinyl->MP3 issue you mention, and I hadn’t even thought of the few annoyingly hidden tracks I have. Also, it will allow me to cut up recordings from radioSHARK. Well I have Sound Studio Pro. Any real reason to switch? Any major advantages to either? Bill: Glad to be timely! Chris: Tough call on SSP…I think most of functionality is well covered there (though I don’t use the tool myself)…but I’d say if you’re still a bit interested, head over to Rogue Amoeba and check out the download and decide for yourself if the extra value of the dedicated tool is worth having as an extra utility. Can you mention the other apps, that are capable of losslessly splitting MP3 files? Have been very happy with Rogue Amoeba and the audio software they make. Audio HiJack Pro is far superior to Wire Tap, IMHO, and Fission is a joy to work with. It is simple, does a few basic things, but does them extremely well! It has been easy and a joy to use and well worth the price. If someone doesn’t have Audio HiJack Pro yet would definately suggested purchasing the bundle with Fission.